When it comes to the storage, no device can come close to the portability that pen drives and microSD cards offer. This deals roundup consists of products like memory cards and pen drives that are from manufacturers like SanDisk, Sony and more. Pendrive and memory cards are usually the preferred options when it comes to the portable storage. These little devices are inexpensive and easy to carry. Today, we have covered some of the best deals of Amazon on gadgets like pen drives and memory cards. The SanDisk Cruzer Blade 32GB Flash Drive is a compact device that lets you transfer files from one computer to another easily. It also comes with SanDisk Secure Access software, which lets you protect your private files from an unauthorized access. Click here to buy. The SanDisk Ultra Dual USB flash drive sports a retractable design which protects it from dust and other potential damage. The pen drive is OTG enabled via a micro USB port, which means one can transfer the files of their smartphone to computer easily. It features a USB 3.0 connectivity, which as per the company, allows the pen drive to transfer the data at the rate of 130MB/s. Click here to buy. 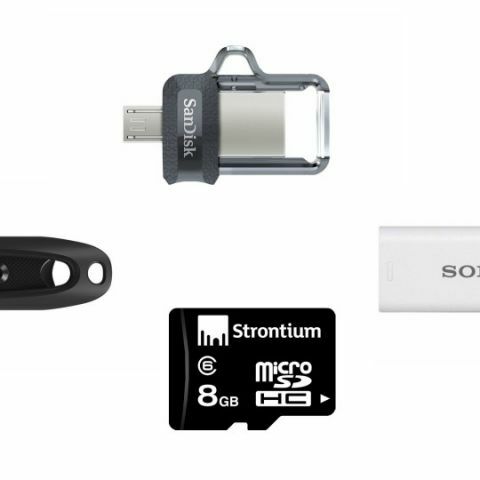 The Sony Microvault 16GB pen drive features USB 2.0 connectivity. The pen drive comes with a retractable design that protects the pen drive from any possible damage. Click here to buy. The SanDisk 16GB microSD Card can transfer data at the rate of 98MB/s. The card allows you to shoot videos and pictures in HD quality with class 10 speed ratings. The SanDisk Memory Zone app transfer the files of your smartphone internal memory to the external card automatically when the internal memory is full. Click here to buy. The Strontium 8GB microSD card is compatible with smartphones, tablets, and cameras. It comes with an adapter that can turn your microSD card into an SDHC card. As per the company, it can transfer the data at the rate of 6MB/s. Click here to buy. The SanDisk 16GB Pen Drive features USB 3.0 connectivity, which can transfer data at the rate of 100MB/s. The device is also compatible with the USB 2.0 interface. With SanDisk Secure Access software, users can protect their private files with password to prevent unauthorized access. The SanDisk is also providing five years warranty on this product. Click here to buy. The SanDisk 32GB pen drive offers the same features as the 16GB flash drive, which we mentioned above. The flash drive comes with five years manufacturer warranty as well. Click here to buy.